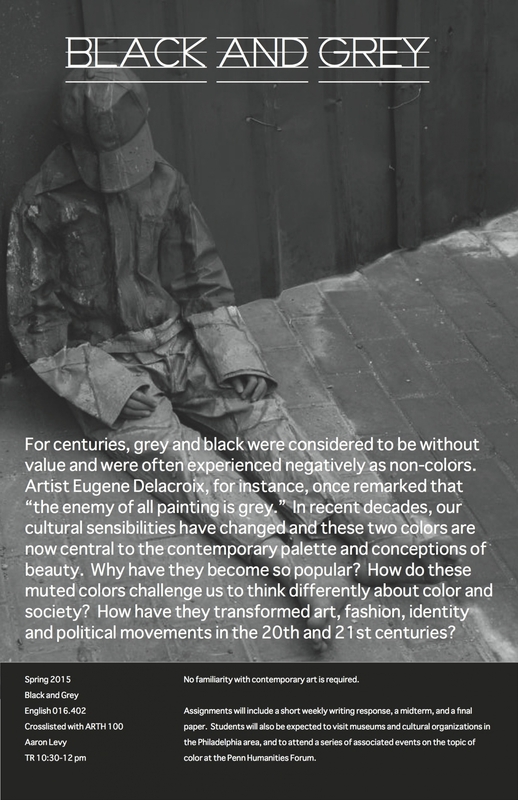 The painter Eugene Delacroix once remarked that “the enemy of all painting is grey.” For centuries, grey and black were considered to be without value and were often experienced negatively as non-colors. In recent decades, our cultural sensibilities have changed and these two colors are now central to the contemporary palette and conceptions of beauty. Why have they become so popular? How do these muted colors challenge us to think differently about color and society? How have they transformed art, fashion, identity and political movements in the 20th and 21st centuries? This freshman seminar will introduce students to the ever-changing cultural history of black and grey. Each week we will study how our understanding of color is socially determined, through the work of individuals who have helped define our experience. Particular emphasis will be given to artists, writers, filmmakers and scholars who have restricted their palette to these particular colors. Some of the artists we will study will be familiar and others are likely to be unfamiliar; they include Kara Walker, Glenn Ligon, Marc Rothko, James Abbott McNeill Whistler, and Sol LeWitt. We will watch films by László Moholy-Nagy, Alfred Hitchcock, Michael Haneke, and others, and read criticism by Johannes Itten, Ludwig Wittgenstein, Darby English, Michel Pastoureau, and other scholars. A variety of guest artists and scholars will also be invited to the campus to address the course. No familiarity with contemporary art is required. Assignments will include a short weekly writing response, a midterm, and a final paper. Students will also be expected to visit museums and cultural organizations in the Philadelphia area, and to attend a series of associated events on the topic of color at the Penn Humanities Forum.